Dad and I passed the gelato shop I visited in 2002 for my first real gelato, an addiction that kept me coming back sometimes 3 times a day. I told him about the mini-tornado that swooped into Venice during my stay, turning the canals into giant wave pools, covering the stones with water along with a torrent of rain. I slipped down the steps of the Rialto Bridge, running for cover with my hostelmate Katie, and we ducked into a bar shortly before they pulled the metal gate closed. We were locked inside to brave the storm. We had a few drinks and met a group of locals that showed us around afterwards. We surveyed the damage, wind battered trees, and flower pots and window boxes broken everywhere. A unique Venetian memory. With pure 10 year old memories, I navigated down the winding backstreets and said, “Ahh yes, up ahead, there will be a turn, a tiny bridge over a quaint canal, and then the street is shortly after that.” Sure enough, we made it to the street and think we found the place. Later, I checked facebook pictures on my iphone and found that I actually took a picture of the door back then, but we didn’t go back to check we were right. Ahh technology! While we were in the neighborhood, we went searching because I remembered many quaint restaurants for aperitivos, but I couldn’t find them. Was I on the wrong streets? Did they close? Nothing is constant except change, even in this well-preserved museum of a city. Eventually we ended up in a charming square, the trees turning brown in mid autumn, folks quietly clinking their silverware against the plates under a starry night sky. We picked one place in the far corner, and sat down for a beer and a meal. I had the lemon chicken and Dad had veal marsala. It was a long yet fun day. We were exhausted, and wound our way to the bus station, the university section of the city before boarding a vaporetto back to our dock, Ca’D’oro. I passed out on the bed in my clothes before 9:30. 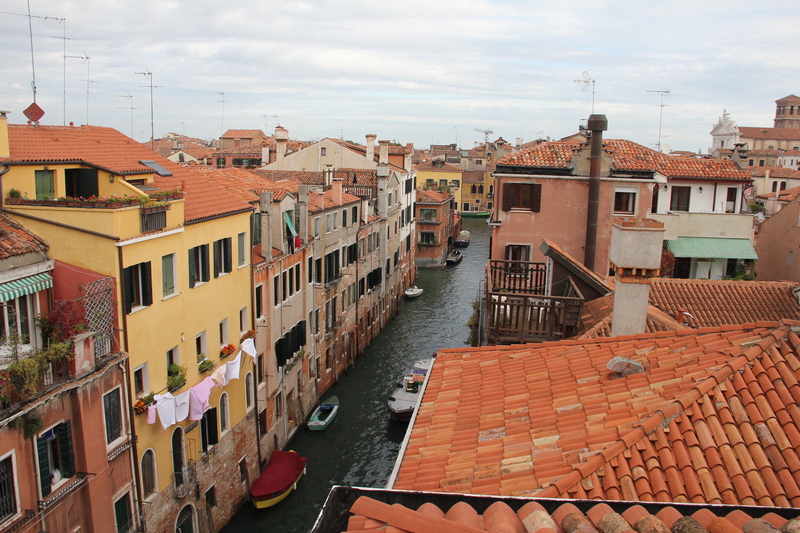 The next day we woke up for another breakfast and checked out the rooftop terrace, which was a special surprise. 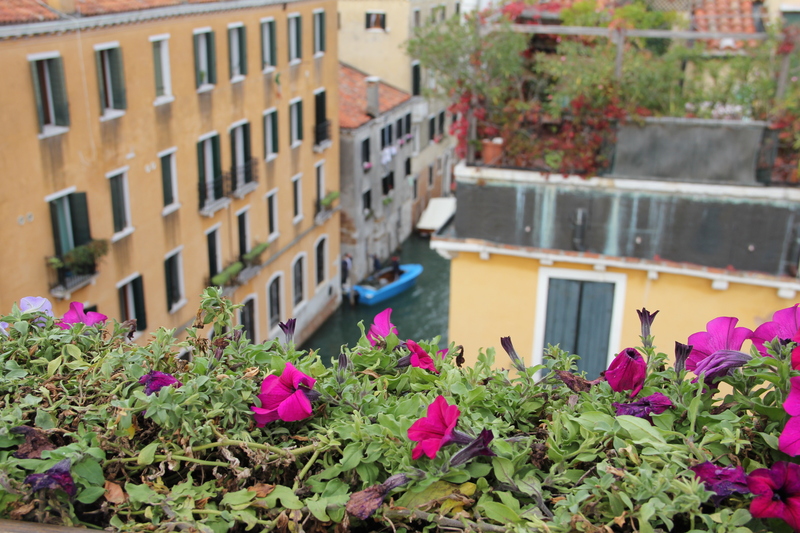 Beautiful and peaceful view of Venice from up there. Boat day. We boarded a vaporetto for the lido. The Adriatic was bright blue, and I kept repeating, “It’s so pretty.” I knew what it looked like, yet I was still happy and surprised to see it again. At the lido, we walked along the main street, past holiday-style tourist shops selling flip flops and sand toys. “It’s a totally different feel here,” said Dad. “Yup, it’s connected to the mainland. More of a resort.” Cars can drive over a bridge to get here, unlike in Venice. 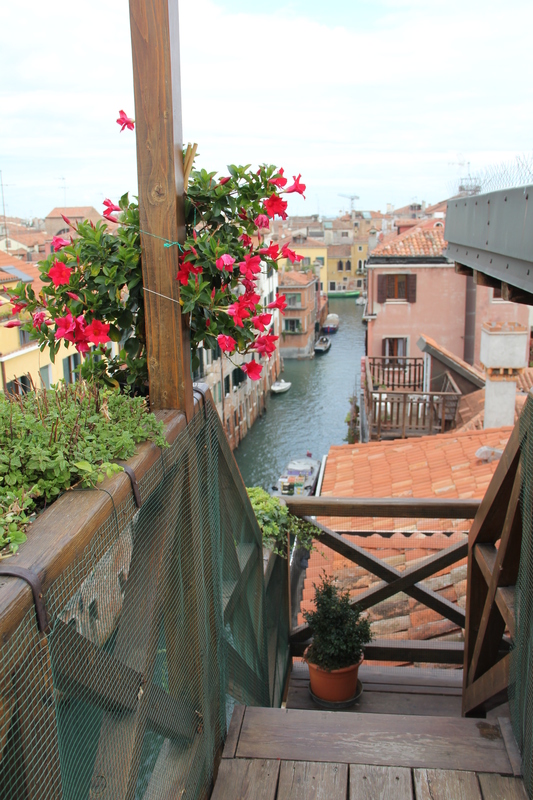 There are plenty of hotels to stay here, and certainly more space, yet it lacks the charm of the tight, winding paths and canals of Venice. We made it to the big, Sandy beach, and gazed out over the blue water, churning and turning gray under a stormy sky. By the time we left the beach, the rain had started, and then it became like a shower by the time we arrived on the island of Murano, world-famous for its gorgeous, colorful glass. The Hard Rock Cafe was nearly impossible to find. The map on the website was . . . wrong. . . misleading. Google maps kept running us around in circles. I even called the restaurant and the directions were confusing at best. 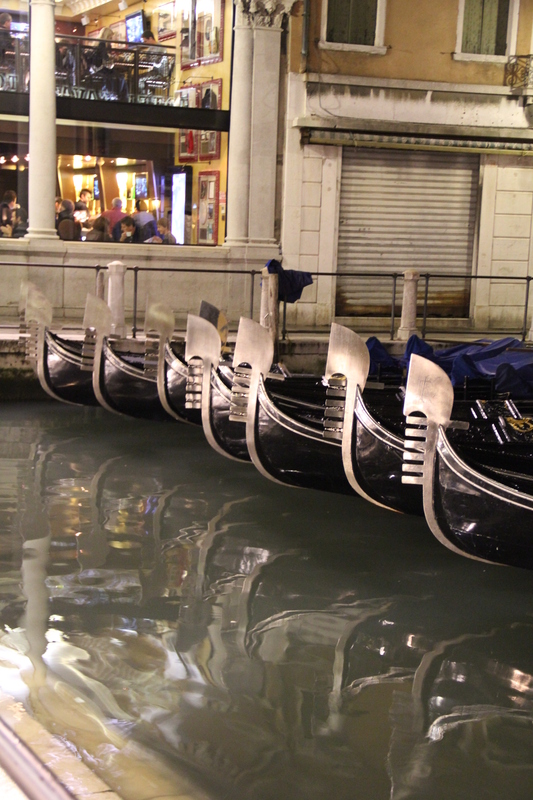 Eventually, my Dad stopped into a shop and got directions that were more clear, and we saw it, glass windows, facing a quiet canal filled with gondolas. Normally a travel sin, but now an oasis. We went inside, while some of my favorite songs blasted in my ears, and we orderd Nastro beer, noshed on cheddar nachos, and by the time our bacon burgers came, we were stuffed but continued. Bruce played. I smiled. Our waitress was one of the top 3 I’ve ever had. Ever. She was so lively, so fun, so funny, dancing in the aisles, joking with us – animated like a cartoon. The next morning, we awoke for our last breakfast. I went outside to try to get a pair of shoes really quick, and saw the ground had buckled. Acqua Alta – the high waters. They seep up through the clay in the rising tide and cause all kinds of damage. Even part of the wall of our hotel had broken through, spilling clay. A neverending battle. They say one day Venice will be just like a museum, with no actual residents because it’s so hard to live here, to raise children when you have to navigate the streets, bridges, canals, vaporettos with a stroller. They claim it would be like a Disneyland for grownups. It would still be amazing, though, even if that happens. Hey, as long as it’s here. The Acqua Alta, though, has other plans. See Venice while you can. This entry was posted in culture, travel and tagged Italy, travel, Venice by liguriansun. Bookmark the permalink.